This is another TBT cartoon inked a year ago but upgraded to colour digitally. Got the idea from just letting the thought of the 3 wise men ruminate in my head for a few days. I was initially thinking of how at potlucks there’s always that one who brings the cheapest item and at modern day it’s probably chips. But to think back a couple thousand years ago, they probably didn’t have chips. I figured its cheap equivalent would be the potato. 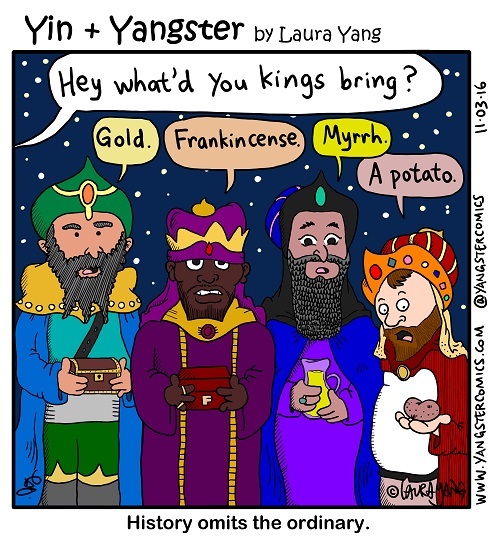 Don’t mind my saying but I absolutely love the Potato King in this cartoon.